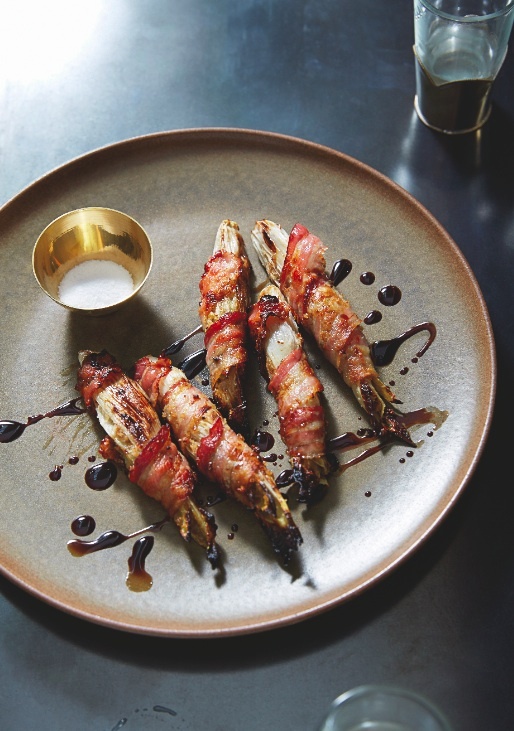 The key to styling this dish by San Francisco chef Craig Stoll look is the cooperation of the pancetta, so make sure to get slices that are thin, yet thick enough to hold together when you wrap them around the endive. (They’ll taste good no matter what.) Also, for easy handling, store the slices in the fridge until use. The garnish, saba, is a delicious thick, reduced, unfermented grape juice that tastes like a non-acidic balsamic vinegar reduction. Whether you try the saba or skip it, this recipe is wonderful. Heads up: You will need 32 toothpicks. Preheat the oven to 350°F. Cut endive in quarters from stem to tip. Arrange, cut side up, in a shallow sauté pan. Spread the leaves gently and season with salt, and then flip them over so the open leaves face downward. Smash 1 clove of garlic with the side of a knife and add it to the pan along with the bay leaf, wine, and 2 tablespoons of water. Cover the pan with aluminum foil or a lid, bring to a boil, and immediately transfer to the oven. Cook for 8 to 10 minutes, or until the endive is tender but not mushy. Remove from the oven, uncover the pan, and cool. Combine 1 clove of garlic and the anchovies in a food processor and pulse until the garlic is finely chopped. Add the breadcrumbs and a generous pinch of salt and pulse to incorporate. Preheat the broiler. Blot the cooled endives with a paper towel. Place one endive, outer leaves down, in the palm of one hand. Gently spread open the leaves, sprinkle 2 teaspoons of the breadcrumb mixture into the leaves, and set on a baking sheet. Repeat with all the endive, then tightly wrap 1 slice of pancetta around each endive. Run 2 toothpicks through each endive, 1 toward the base and 1 farther up, to help them maintain their shape while cooking. Cook the wrapped endives under the broiler until the pancetta browns on one side, about 5 minutes. Turn over and cook 5 minutes more. Remove the toothpicks, arrange the pieces on a platter, drizzle with saba, and serve.